This "Historically Speaking" column was published in the Exeter News-Letter on Friday, November 21, 2014. When I first arrived at the Exeter Historical Society in 2000, Ed Chase, the former society president, welcomed me warmly, and among the many stories he told me about the organization was that of the Exeter overmantel. Although I’d studied early American material culture, I’d never heard of an overmantel, other than as an architectural feature – perhaps decorative woodwork, particularly small shelves for knick-knacks – located above a fireplace. The overmantel Ed was speaking about, however, was a landscape painting and it was no longer in town. In the early nineteenth century, overmantel paintings were fairly common in grand houses of New England. There are numerous examples scattered in museums across the region. Usually painted on wood, these pieces generally depict landscapes and frequently include the owner’s house or land. Josiah Coffin Smith was newly married in 1787, when he began building his house off High Street in Exeter. One legend, published in a 1928 pamphlet called Exeter Points of Interest, says “in digging the cellar a skeleton of an Indian and several pewter spoons were found.” One can only hope that the skeleton was respectfully interred else ware – we don’t know any more of the story. Smith lived in the home until his death in 1842, and sometime around 1800, he had the overmantel in his house painted. The piece is not signed and it’s likely that the painting was done by an itinerant artist. In the usual style of overmantel paintings, it is a landscape of a town on a river – not unlike Exeter, but clearly not Exeter. Many examples of overmantel paintings include settings on waterways. 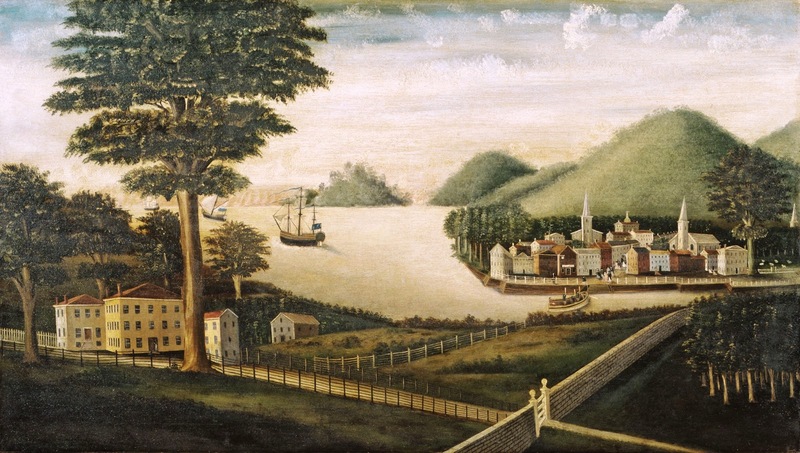 Exeter, by 1800, was a bustling port town. The lumber industry had settled down after a century of furious deforestation and new businesses, including leather and printing, had filled the potential void. The picture in Smith’s house depicts a prosperous homestead across the river from a bustling village where the villagers have come out to meet an approaching boat. Two towering church steeples overlook the town. Smith’s home was across the river from the town center, but this is where the similarity of Exeter to the painting ends. Both the homestead and the town are slightly too opulent for the time depicted. The river seems to broaden upriver, while in Exeter the river broadens downriver from Smith’s house after a series of waterfalls that do not appear in the painting at all. If Smith hired an itinerant painter, as we’ve supposed, it’s odd that the painting isn’t more realistic. Of course, it’s entirely possible that the painter never visited Exeter or only had the merest of descriptions of the town. Maybe the painter was told, “our house is on the river, just over the bridge from the village” and that was all the information provided. We’ll never know, because there are no records surrounding its creation. Maybe the painter had a few standard paintings that he regularly produced, and made very simple changes at the request of the buyer. The painting, oil on wood, remained part of the house until 1947. By that time, the house had changed hands and was eventually owned by brothers John and Gardiner Gilman. They rewarded their long-time housekeeper, Harriet Tilton, with the house. She rented it to Phillips Exeter Academy and it was used as a Greek fraternity house with Miss Tilton serving as matron. Upon her death, the Academy took ownership and the Exeter Historical Society was allowed to take a few items for its collections. William Perry Dudley was serving as director of collections and eagerly requested the overmantel – sometimes called the “Gardiner Gilman overmantel” – but it won’t be found at the Exeter Historical Society today. The painting was sold in 1972, to the Amon Carter Museum in Fort Worth, Texas. It’s rare for a museum to allow such a treasure to leave its collections. Especially since this was a work of art that had its origins in the town of Exeter. Ed Chase, however, wasn’t troubled by the decision to sell the painting. In 1972, the society had taken on a very expensive piece of historic preservation by purchasing the Sullivan-Sleeper house in the town square. Funds were tight and some difficult decisions needed to be made. The painting, it was noted, did not depict Exeter. Nancy Merrill, our curator at the time of the sale, later remarked, “Our Society felt very badly about selling the overmantel piece. However, we desperately needed the money to take care of the Sullivan-Sleeper House. The overmantel piece has gotten much more publicity and attention in its new home and more people have been able to enjoy it.” Her observation was correct, but quite frankly, Fort Worth is a long way from Exeter. Happily, in 2004, the overmantel was purchased by the Currier Museum of Art in Manchester where it can still be visited today. Ed Chase was not involved in the sale of the Exeter overmantel, but he was comfortable with the decision. He served for fifteen years as the president of the Exeter Historical Society, retiring from the position – but not the organization – in 2000. He passed along the story of the sale to remind us that sometimes stewardship requires us to let things go. Caption: Overmantel painting, now at the Currier Museum of Art in Manchester, was once in the Gardiner Gilman house in Exeter. The Exeter Historical Society, in 1972, weighed the benefits of owning the piece against the need for funds for historic preservation and reluctantly sold it to a museum in Texas. Happily, it is now back in New Hampshire.